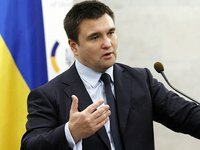 OSCE envoys to the Trilateral Contact Group (TCG) in Minsk have suggested creating a joint UN and OSCE peacekeeping mission in Donbas, Ukrainian Foreign Minister Pavlo Klimkin has said. "Even OSCE representatives who are working on the Minsk platform have come out with a proposal to create a joint OSCE and UN mission. This joint mission should have a military component, a police component, and an international administration. This is clear to everyone. Russia, as you know, is trying to manipulate [things] in view of the upcoming elections [in Ukraine] and in this way to meddle with our politics and affect our elections," he said at a press conference in Severodonetsk on January 16. Klimkin said the conflict in Donbas can only be resolved with the help of an effective peacekeeping mission.